In November, the LC Labs team welcomed Laura Wrubel as she kicked off her research leave in residence with the Library of Congress. Over the next 3 months, she’ll explore digital scholarship with our team and how it might be best supported. We checked in with her to learn more about her goals, background, and experiences so far. LC Labs: Hi Laura, we’re so excited for you to join us! To start, would you tell us a bit more about your background? Laura Wrubel: I’ve worked in libraries my whole career, in a variety of roles that have mostly involved creating and supporting applications for discovery and research. I started at the U.S. Census Bureau Library, then worked at the University of Maryland Libraries, and am now in the Scholarly Technology Group in the George Washington University Libraries. My work has always centered on connecting people with the resources they need, whether that’s linking them to collections online or helping them build skills to further their research. Some recent work I’ve found particularly exciting has involved helping students and faculty collect and analyze social media data, using Social Feed Manager, open source software we developed at GW. Social Feed Manager removes some of the barrier in connecting with social media platform APIs. Having access to social media datasets opens the door to answering questions from a wide range of disciplines, but also usually leads to further interesting questions about how to explore, analyze, and visualize the data. My colleagues and I also provide a “coding consultation” service, which helps students and faculty who are working on an academic or scholarly inquiry which requires coding. Learning to use code isn’t an end in itself, but a powerful way to answer questions posed of data. 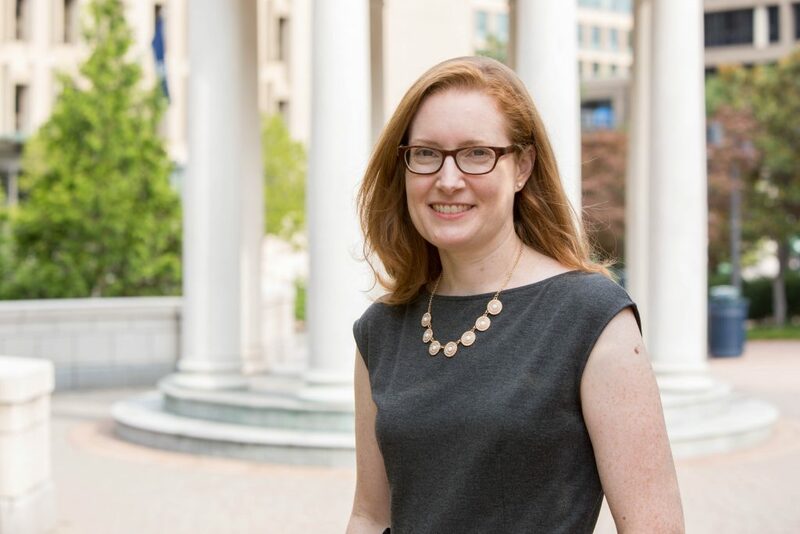 Laura Wrubel, Software Development Librarian at GW Libraries, will spend three months of research leave with the National Digital Initiatives team investigating ways to support digital scholarship at the Library of Congress. LC Labs: You have a unique professional opportunity. Can you share what you plan to do during your research leave from George Washington University Libraries and why you decided to spend this time at the Library of Congress? Wrubel: One of the great benefits of being a librarian at GW is that we have the opportunity to take research and professional development leave toward research projects, teaching and curriculum development, advanced degrees, or other professional development programs. I’ve just started three months of research leave to explore with National Digital Initiatives how the Library can further digital scholarship, both at the Library and beyond. This will include working with Kluge Center Scholars, developing sample code for others to use, and creating workshops or other resources to support both library staff and individuals who want to use digital methods with the Library’s collections. I was excited when the Library of Congress created National Digital Initiatives and dedicated staff and resources to cultivate innovative uses of the Library of Congress digital collections. The following year, the report they sponsored by Michelle Gallinger and Dan Chudnov identified overall directions and specific steps that the Library could take toward creating a “Lab” with services for researchers working with the Library’s digital collections at scale. I’ve been interested in how to apply digital methods to library collections and how those of us in libraries can foster and support that kind of work in our communities. So, the report’s recommendation to increase the approachability of LC collections and provide interfaces that support researchers and individuals really resonated with me and what I’ve been seeing emerging at my library and others. In fact, many libraries, museums, and archives are already engaged in this kind of support for digital scholarship, and I think the Library of Congress, with the spectacular depth and breadth of its collections and a strong technical infrastructure is in a position to foster experimentation and demonstrate this at another level. LC Labs: The Library’s collections, digital and otherwise, are immense. Have you already decided what resources you might explore? Wrubel: The LC for Robots section of the new Labs site is something I’m both very interested in using and contributing to. On that page, you can find examples of Python code demonstrated using Jupyter notebooks, which are an interactive, browser-based tool for stepping through code for working with data. They’re a great resource for people interested in how you might interact with the Library’s APIs and what you might find in working with them. I’d like to create some notebooks to further demonstrate the possibilities of the Library’s APIs and data, helping people get going with their own work with digital collections. I’m also interested to spend time with the Kluge Scholars and others at the Library, to learn more about the problems they’ve encountered in their research so far and what they’ve found useful, understand where they’d like to apply digital methods to collections, and help them go further in their research. LC Labs: You’ve been here with us for only a short time – what have you been able to learn about the Library so far? Wrubel: I’m only a week into my research leave, and already I’ve had the opportunity to hear some fantastic talks and meet people working to analyze and showcase digital library collections. Shawn Averkamp from New York Public Library, as part of an event hosted by NDSR resident Charlotte Kostelic, gave a thought-provoking talk, “Computation as Conversation” about her observations working with collections as data. At GIS Day, I saw the results of Library of Congress curators and librarians using the ESRI Story Map platform to explore and tell stories with materials in their collections. And at the conference “Designing the Future Landscape: Digital Architecture, Design & Engineering Assets” I saw some innovative and fascinating ways that architectural digital collections are made accessible for use. I’ve also been digging into the Loc.gov JSON API a bit and exploring web platforms for scholars to share their work. LC Labs: Last question! What would you most like to achieve during your time here at the Library of Congress and with National Digital Initiatives? Wrubel: I have several goals for my time here with the Library of Congress. I’d like to further develop my understanding of software tools that are potentially relevant to exploration and analysis of library collections, beginning with Library of Congress collections. For example, I’m interested in spending time with Python libraries that offer data analysis and visualization capabilities. Taking what I learn, I’d like to create and share create additional Jupyter notebooks using Library of Congress collections, and experiment with ways to make those easily usable by individuals. I’m also looking forward to consulting with Kluge scholars working with Library of Congress collections, and both learn and provide support in their approaches to digital analysis of collections. I hope this experience, rooted in real needs and questions, might contribute to the Library’s planning and implementation of digital scholarship “Lab” services. I’d be happy if my time here included sharing what I learn with Library staff, perhaps in the form of a workshop. I saw the exciting potential of librarians building an understanding of digital scholarship tools while being involved in putting on the event “Hack to Learn: Collections as Data” with George Mason University and the Library of Congress in May 2017. That two-day event brought together librarians, curators and collection experts, graduate students and faculty to explore the possibilities of computational analysis of collections. We included a series of workshops on tools like OpenRefine, MALLET, Voyant Tools, Carto, and Gephi and the participants used them in small groups with a range of collections from Library of Congress, the Smithsonian Institution, and GWU. I’d like to develop more facility with these and other tools for exploring digital collections, and understand how they might be best used toward the end of being able to teach and build others’ comfort with them. There are a lot of people in libraries, museums, archives, universities, and schools who have– for years–been putting thought and effort into fostering and supporting digital scholarship. I’m looking forward to the time and space that this research leave affords to dig into that work and benefit from their thinking and experimentation. I’m thrilled to be able to spend time here at Library of Congress with their deeply knowledgeable staff and phenomenal digital collections. I’d be interested to talk with anyone who has ideas about this exciting kind of work! You can follow Laura Wrubel (@liblaura) on Twitter and watch for more of her work and experiences on the Signal in the coming months. This is a syndicated post. Read the original at The Signal 2017-11-20.